Every Central Signal alarm is a sophisticated security, home automation and energy management platform. You can use as few or as many of these features that you want, without ever having the need to upgrade your system in the future. We create complete and remotely controllable acccess to your systems advanced features, by adding Alarm.com to your included services. Learn here what Central Signal can do for you and your family. Full Voice Response – The panel gives clear notifications that indicate system status, zone descriptions, alarms and emergencies. Date, Time & Weather Display – The panel scrolls through date, time and real-time weather forecasts and severe weather alerts. Quick Access – One touch access allows the quickest help possible in an emergency. The panel’s LED buttons indicate the system’s status. Convenience – The fully self contained panel contains a snap-in GSM Radio, up to 24-hr backup battery, and allows 32 user codes to monitor up to 48 supervised wireless zones and 2 hardwire zones. User Friendly LCD Touch Screen – The easy-to-use color touch screen puts a wide range of security and home automation controls at your fingertips. Multiple Arming Options – Secure your home by arming your system “AWAY” or “STAY.” The Quick Arm/Exit and Bypass features offer added convenience. 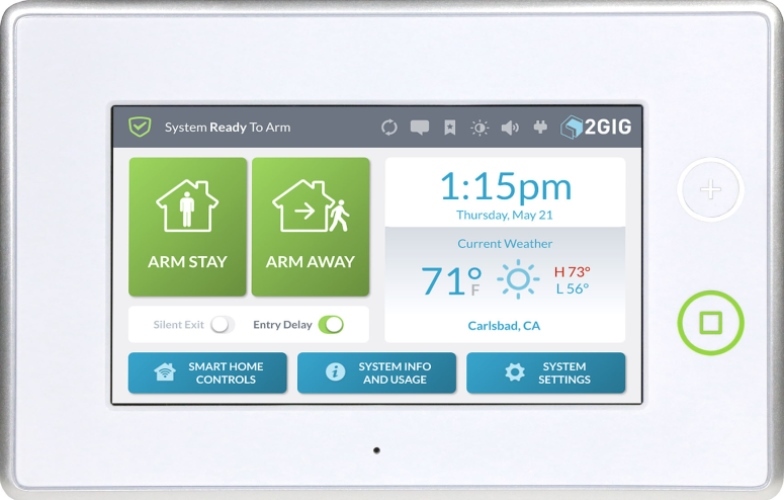 Home Automation – The panel’s built in Z-Wave radio enables various home automation functions including HVAC, appliances, and lighting control. Two-Way Response over Cellular – Two-way voice lets central station operators listen in and talk to you when a signal is received, ensuring that the proper emergency response personnel will be dispatched if necessary. Advanced Compliance – CSC is 3G/4G compliant now on all cellular communications systems, several years ahead of the announced and scheduled 2G sunset that will force other companies to this standard. Over-the-Air Updates – There’s no need to worry about your panel’s software getting outdated. With our Over-the-Air function, your panel will automatically be updated with the latest software. Remote Control Options – Always be in control by remotely managing your system from a computer or web-enabled mobile phone (Blackberry, iPhone, Droid). Seamless Alarm.com video integration – Remote and local viewing of live and recorded video activated through your alarm system’s macro settings and push notifications. Fully integrated with your security app on your Smartphone, PC or Mac. Instant awareness of important events — know when your kids get home from school, when there’s a water leak in your basement, when you’ve left the premises without arming and more. Live & recorded video footage — see who’s at your front door from your computer or cell phone. Notifications with video email attachments — see who’s in your driveway when you’re not home. Unique lock access code options for neighbors or the dog walker, etc.